The next steps were quite easy. With the new positions I improved the orbit and was able to find more and more images/positions. In the end the arc was extended until mid-December 2001! Missing NEAT images were later kindly provided by Dr Steven Pravdo of the NEAT project, which helped to complete the dataset. After I had collected my data and was looking at the resulting orbit, I was finally sure that it was a comet. It had a Jupiter MOID of about 0.65 AU, and indeed it had an approach with Jupiter before its next perihelion in 2007, which caused the perihelion distance to increase by about 0.1 AU. 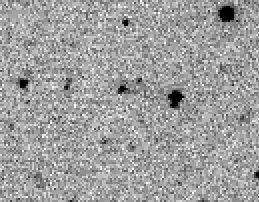 However, this 2007 perihelion looked favourable and I tried to detect any matches in the MPC ONS file. However, nothing was found. 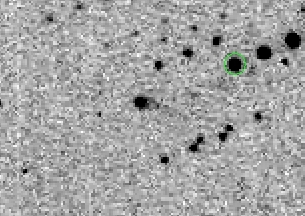 After I had sent in the data and Brian Marsden detected the single LONEOS observation of October 24, we wondered whether other surveys might have imaged the object without measuring it. However, again no success. Robert McNaught checked Siding Spring Survey images of July 2007, which covered the expected position of the comet, but nothing was seen. The comet was too faint, maybe due to the larger perihelion distance or maybe due to the fact that it was unusually active in 2001. Checks of LINEAR data also proved not successful, and a check by Andrea Boattini of Catalina and Mt. Lemmon images showed that these surveys missed the comet always by a few degrees. The comet was finally reported in IAUC 9129, and MPEC 2010-F38. So, why was the comet not discovered in 2001? I think the main reason is that it was automatically detected and measured and nobody really looked at the images. If this would have happened, it would have been identified as a comet and quickly followed up. The reason that the comet was not again automatically detected by NEAT is due to the fact that of the usual NEAT triplets often only two or even one were of good quality and thus did not qualify for reporting. Add to that the fact that after August the next detection was in October, quite a large gap to get a succesful automated linkage. If the object would have popped up at the NEOCP things would have looked different. Early September 2014, I wondered whether the large surveys would cover the region of the position of the comet since it had reached 90 degrees elongation after passing perihelion on April 22, at small elongations. However, the expected brightness was around 20-21 mag, so only observatories which can reach 21 mag routinely would be able to find it – if at all! On September 5, I contacted Eric Christensen (Mt. Lemmon Survey, G96), Jim Scotti (Spacewatch, 291, 691) and Richard Wainscoat (PanSTARRs, F51) and asked whether they might be able to check the area in question. I estimated the uncertainty in T as +/- 0.77 days, corresponding to a line of variation of about +/- 18'. Surprisingly, Eric was able to recover the comet only 12' from the prediction. But it was the end of the lunation and there was bad weather ahead so he was not able to get a needed second night. Jim Scotti had similar problems. So, on September 6, I contacted Robert Holmes (Westfield, H21) asking for help, since he is also able to go deep with his equipment. He succeeded on September 7, and the comet was also detected by him. One day later, two pre-recovery observations obtained by Hidetaka Sato from iTelescope Observatory (Siding Spring, Q62) were reported. Hidetaka had tried to recover the comet then but did not find it. After the September observations were known he was able to detect the comet in his images. The comet was then announced on September 12 in CBET 3972 and MPEC 2014-R91 and designated P/2014 R2. Below are the linked orbits for the apparitions since 2001 up to 2020. The latter one will be quite favourable with the comet reaching magnitude 18. From 29 observations 2001 Aug. 18-2014 Sept. 7; mean residual 0".457.